I just heard word that the San Diego Towerthon is on again for this June. I did this last year, and I did pretty well, climbing the 25-story building 17 times in 2 hours. That evening, I was adding it up, and 17 times up the building totals 5,015 feet climbed. And this planted the seed of an idea. I figured out that 18 times up that building would make a vertical mile. I made this a personal goal, and I finally made my vertical mile stair climb at one of the practice sessions at the Aon building last month. And along the way, I managed to convince several other people to do it, too. It’s a deliberately crazy idea, and I’m a bit surprised that it caught on. So my goal for the Towerthon this year is to do 18 or more times up the building. 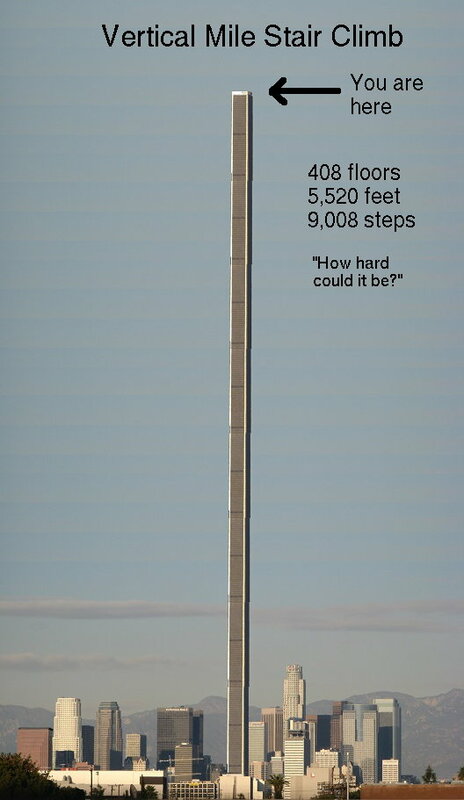 That totals 432 floors, 5,310 feet, and 9,108 steps.